Our nation is growing at a rapid rate, but that growth looks much different than the population we see today. Increasingly, healthcare providers are not only going to encounter patients who look different, but also patients who speak different languages, hold different cultural beliefs, and are potentially accustomed to healthcare from other parts of the world. As the nation makes a shift toward a minority-majority balance, the need to identify and eliminate disparities in care is becoming critical. Delivering equitable care in no longer just the ethically correct path for hospitals and health care systems to take, equity is vital to being able to effectively respond to patient needs, staff your organization appropriately, and improve overall community healthy. Equitable care is the ability to provide care of equal quality to everyone regardless of race, ethnicity, or any other demographic factor. Disparities in care can have a detrimental effect on the quality of care that is provided to patients. Taking action to address these disparities can improve patient scores across entire patient populations. Disparities may increase the cost of care, including through excessive tests to compensate for communication barriers, medical errors, increased length of hospital stay, and avoidable rehospitalizations. Patients who are racial and ethnic minorities may be more prone to medical errors; they may also have longer hospital stays and more frequent avoidable rehospitalizations, and experience other adverse health outcomes. Our level of assessment depends on your organization’s unique needs. We can complete an in-depth review of both organizational and patient data, or for clients focused exclusively on language services, a needs assessment and orientation can jump-start our work together. In this phase, CulturaLink will guide clients in the development of a strategic plan that clearly articulates the vision for understanding and its connection to the mission of the organization. A working session with leadership and initiative owners is facilitated to develop a work plan. Based on the learnings in the Discover and Design phases, we deploy recommended programs and create metrics to monitor the success of our initiatives. We provide customized suggestions for the implementation of diversity and inclusion training and Language Services. CulturaLink is your partner in providing the best in diversity, inclusion and cultural competence training for your employees. We can help with everything from teaching staff how to recognize their own biases, to teaching them to work effectively with interpreters in the clinical setting. We provide engaging and interactive in-classroom and e-learning programs on foundational issues of diversity and inclusion, such as interacting with specific cultural and ethnic groups. CulturaLink offers a comprehensive assortment of training programs in leadership development, diversity and cross-cultural healthcare issues. Our courses are designed to help organizations adapt to and support organizational readiness, remove barriers to service, increase effectiveness and improve the internal climate in terms of diversity, inclusion and cultural competence. Our courses are offered in the critical areas of Diversity and Inclusion, Cultural Competence, Employee Engagement and Human Resources. Providing equitable care is no easy task. It takes commitment and preparation to make it a reality. 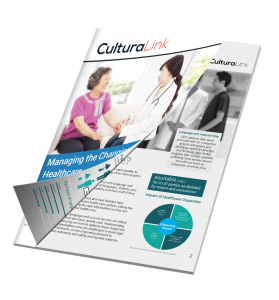 Download our guide to equitable care and an increasingly diverse patient population, and learn how you can identify where disparities of care exist and take the appropriate steps to address them.